It is somewhat a routine for Apple to release a new model of the iPhone series annually. Since the number of iPhone users keep increasing, it is common to find user encountering data loss problem. There are many reasons that you may lose your important and irreplaceable files. To prevent this from occurring, it is safer to depend on this article which offers two ways for you - free recovery from official iCloud and iCloud recovery software. Considering there is no totally free software, here iMyFone D-Back iPhone Recovery is highly recommended which offers free trial version for you. It is an efficient way to recover lost or deleted files on most Apple devices such as the iPad, iPhone, iPod Touch with simple steps. 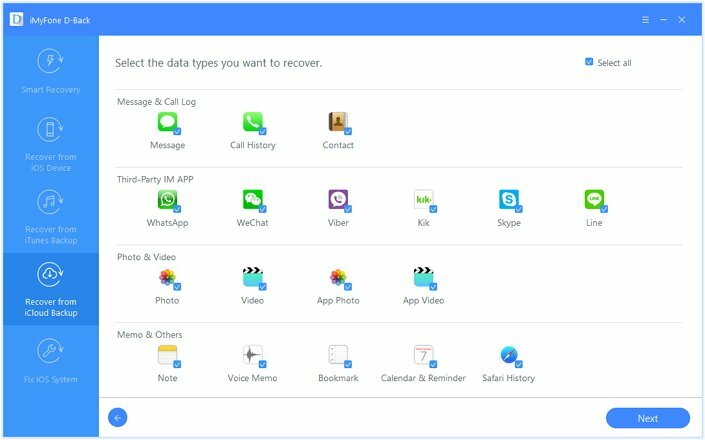 With this software, recovery of iPhone data will be much easier. Four Methods of iOS Data Recovery: Smart Recovery, Recover from iOS Device, Recover from iTunes Backup and Recover from iCloud Backup. 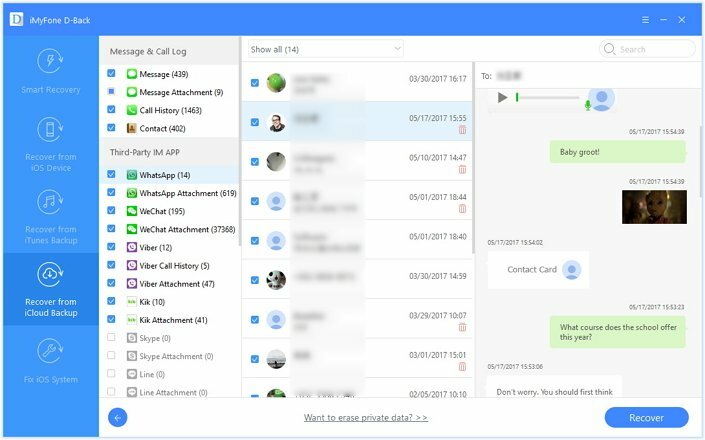 Support Various iOS Devices & File Types: compatible with a range of data files such as: WhatsApp, Viber, messages, music, photo, etc. and can support latest iOS devices running with iOS 11. Repair iOS Issues:fix common problems like reboot loops, device screen flashes, stuck in black/white screen, stuck on apple logo/recovery mode and more. 1. Run this software on your computer to access the Recover from iCloud Backup option and click Start. 2. Select the file types you want to recover from your iCloud backup. 3. 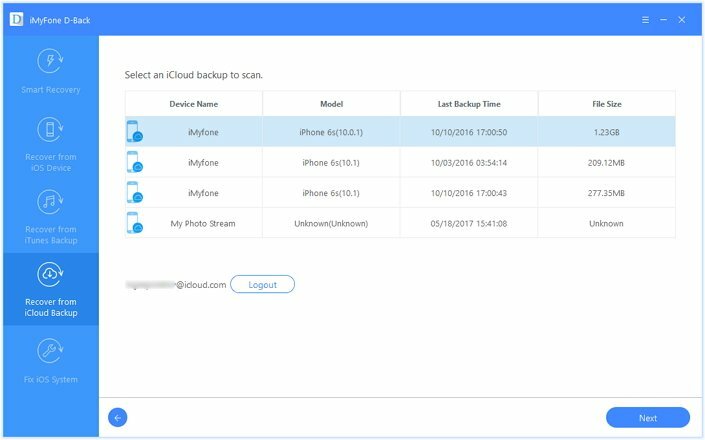 Log in to your iCloud account and the software will list all related iCloud backup. Choose the most related one to download. 4. Preview the files for free and finally select a location to store the recovered files, for example, recovering deleted iPhone WhatsApp data from iCloud. This is a free & alternative way for iCloud data recovery software to restore your data. 1. Go to Settings -> General -> Software update and follow the on-screen instruction to install the latest iOS version on your device. 2. Check for recent by backups identified by date and size while going to Settings -> iCloud -> Storage -> Manage Storage. 3. 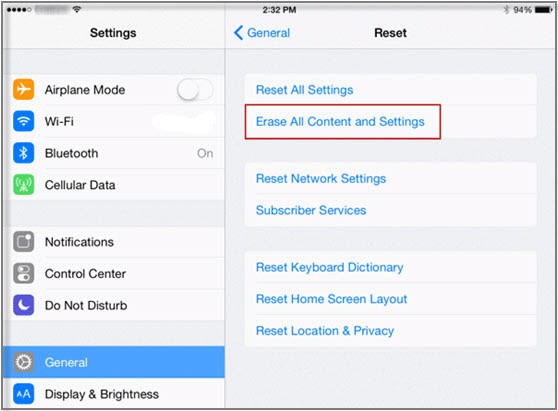 Next, follow Setting -> General -> Reset and tap“Erase all content and settings”. 4. 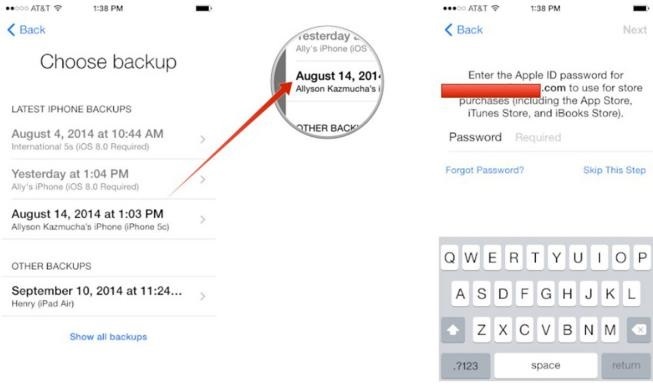 On the Apps & Data screen, click Restore from iCloud Backup and sign in to iCloud. 5. Select the backup to restore from the list you see. 1. Turn on your iPhone. 2. On the App & Data Screen, click on the Restore from iCloud Backup and then sign in to iCloud. 3. Decide which Backup you would like to restore and tap on it. However, there are some problems you might face when restoring with iCloud. For example, any data between the time you restored data to your device and the time you backed them up on iCloud could be lost. It often costs a lot of time to recover and may corrupt easily during restoring. Other limitations when using the iCloud to back up and recover data also exist, such as hidden files cannot be viewed. Despite restored from backup and based on defaults settings, it is not possible to access these hidden data through iCloud. Although it is an easy and free solution for recovery, this restore is not the most efficient one. 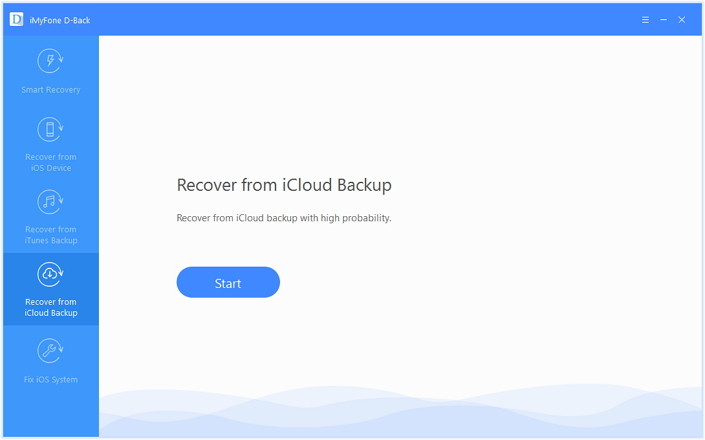 Whenever you are in need of the free iCloud recovery software to help with retrieving your data, your best and most reliable choice is to use the iMyFone D-Back which offers much more than the iCloud restore. Make it a top-notch recommendation for iPhone users.